The gas tank on the Goldwing isn't actually a gas tank. It is a "false tank", or "shelter". The gas tank is actually located under the seat, next to the battery. Under the false tank is located most of the electrical components for the motorcycle, the filler neck for the gas tank, and either a storage area, or the air compressor and valves for the air suspension, depending on the model of Goldwing that you own. 1. Remove the seat. Instructions on how to do this can be read here. 2. Remove the fairing lowers. Instructions on how to do this can be read here. 3. Remove the two bolts holding the back of the false tank to the motorcycle frame crossmember. 4. Looking in through the side of the motorcycle where the fairing lowers normally go, you will see two bolts recessed in a few inches, almost directly above the radiator. Using a socket extension, reach into the space exposed by the fairing lower panels, immediately below the fairing, and remove the bolts holding the front of the false tank to the motorcycle frame (one on each side). If your motorcycle does not have air suspension installed, then skip forward to step 15: steps 5 through 14 involve disconnecting the air suspension before removing the false tank. 5. Put a wrench on the smaller of the two nuts on the hose fitting on the top of the right shock. 6. Put a larger wrench on the larger of the two nuts. The smaller wrench is not shown in this picture, for clarity. While holding the smaller wrench still (preventing the smaller nut from moving), loosen the larger nut. After a turn or so, it should be able to be removed with your fingers. Unscrew it and pull the hose away from the fork fitting. 7. Remove the right side cover and repeat the same removal procedure on the rear suspension air fitting. 8. Open the false tank lid. Remove the banjo fitting from the top left of the compressor. Don't lose the O-ring! 9. Remove the left rearmost fitting from the bottom of the air suspension control panel, under the tank lid. Again, don't lose the O-ring! 10. Disconnect the air compressor power plug. 11. Pull the air compressor up and out of the false tank. 12. Pull the rear suspension air hose out of the frame and up through the middle of the false tank. 13. Ensure the front suspension air hose is clear of any obstruction. 14. Disconnect all four wire bullet connectors leading to the air suspension control panel. Don't worry - all the wires are different colors, so you can't mix them up on reassembly. Make sure you pull on the connectors to disconnect them, not the wires. 15. Gently pull the back of false tank up slightly, then to the rear of the motorcycle, and lastly pull it up and away from the motorcycle. Set it down on something soft to avoid chipping or scratching the paint. 16. To reinstall, gently position the tank in place, and allow the front of the tank to move into place before the rear. You may have to spread the tank halves (the tank is made of two halves bolted together) slightly in order to get it to fit correctly. 17. Ensure the front bolt holes of the tank slide over the outside of the frame mounting tabs, as shown in this picture. In this picture, the tank bolt holes (top) are sliding correctly over (on the outside of) the frame mounting tabs. Make sure this is done on both sides before installing any bolts! 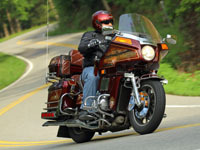 If your motorcycle does not have air suspension installed, then skip forward to step 32: steps 18 through 31 involve reconnecting the air suspension. 18. Ensure the front air hose comes out the front of the tank. 20. ...and under the engine mount and frame member as shown. 21. Place the rear hose on the fitting, and tighten it finger tight. 22. Holding the smaller nut from moving, tighten the larger nut on the fitting. 23. Perform the same operation to fasten the front hose onto its fitting. 24. Ensure that the front hose is routed correctly next to the fuse block. 25. Reconnect the wires from the compressor control panel. Note each color matches the color of the wire it is connected to. 26. Insert the air compressor into its position under the false tank. Fasten the smaller banjo air fitting to the air compressor. Note the position of the O-rings. 27. Righten the fitting in place. Note that the hose exits between the two metal protrusions on the air compressor. 28. Fasten and tighten the banjo air fitting to the compressor control panel. 29. Reconnect the power connector for the air compressor. 30. Arrange the compressor and its hoses correctly within the false tank cavity, and close the tank cover. 31. Turn the key switch on, and pressurize the front and rear suspensions to check for proper operation. 32. A trick for holding nuts or bolts in a socket wrench, when they may fall out: place a piece of a shop towel on the head before inserting it into the socket, and it will be held firm. 33. Install, but do not tighten the front bolts. 34. Install and tighten the rear bolts. Once they are tightened, fully tighten the front bolts. 35. Replace the fairing lowers. Instructions on how to do this can be read here. 36. Replace the seat. Instructions on how to do this can be read here. Okay, so how do you remove the "Real" tank? Remove the seat and the top compartment (aka false tank). Remove the fuel tank cap and overflow tray. Remove the right side cover. Remove the rear master cylinder mounting bolts and push rod clevis pin. Do not disconnect any brake hoses or rear suspension air hoses. Turn the fuel valve off. Remove the inlet hose from the fuel pump. Turn the fuel valve to RES to drain the fuel tank. Remove the rear wheel and shock absorbers. Be sure to support the swingarm so that it does not drop and damage the final drive gear case or brake hose. Disconnect the tail light and turn signal wires. Remove the hand rail and both sections of rear fender. Remove the left side cover. Remove the battery and the battery box. Remove the left side engine mount plate. Remove the fuel valve. Disconnect the fuel gauge wires. Remove the tank bolt and cross plate. Move the fuel tank toward the rear of the motorcycle and out of the frame. From people who have done this procedure before, I have heard it is VERY difficult, and will cause a lot of sweat, skinned knuckles and blue air. Wow! That sounds pretty involved, but I'm not surprised. I guess a fuel tank (properly cared for) shoud almost never have to be removed. I already have the rear wheel off and I have to replace all the fuel lines anyway, so I figured now is the best time to refurbish the tank (It's pretty rusty since the bike has been sitting for 10 years). Thanks for the information and I hope I didn't come off as ungrateful for the DIY above; This forum has been VERY helpful. Thanks again! If the bike was allowed to sit with less than a full tank of gas for a long time, the inside of the gas tank can rust. Might be worth having a look inside to check out the state of it, anyway. The instructions were for a GL1100A.....but is it the same for the GL1800? The GL1800 is completely different. But you can find instructions for it in the Honda Service Manual, that you can download from the Manuals page. 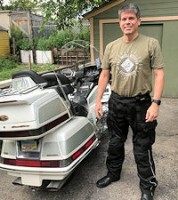 I Have an 86 GL1200 Interstate (so no onboard compressor). I found this article very helpful, but I do want to state that on the GL1200 the mounting bolts for the false tank are in a completely different place. It is not neccessary to remove the fairing lowers. There are 2 bolts on top in front of the painted false tank. They are located underneath the removable black plastic filler panels (one on each side that meets the lip of the fairing sidepocket. These panels were difficult to remove (no tools required) mine were flexible enough I could just bend them up and access the bolt underneath. The rear 2 bolts are located 1 on each side on small ears that are the lowest furthest back part of the false tank painted assembly. Normally this area in covered by the side covers, and the bolts are adjacent to the upper front sidecover grommets. Remove both bolts. Lift rear of assembly up and slide slightly forward then lift up without bumping. This is a great tutorial and it helped me out a lot. One thing to mention though on my 1983 Aspy I didn't need to remove the compressor before removing the tank. I noticed that the false tank can be lifted out with out removing the compressor. When everything was out I also noticed that I can just flop the compressor out of the way (even with the tank on) and change the air cleaner if I wanted to. A big advantage over those with the 1800s. I did have an after market wire that the PO had put in and went through the false tank brackets so I had to cut it in order to remove it. I will replace it with a plug. That's an advantage to the 1983. On the 1982, the pressure adjustment buttons and gauge are mounted on the top of the false tank, so all the compressor plumbing is connected directly to it - so this has to be disconnected before the tank can be removed. On the 1983, the buttons and gauge are moved to the dash instead of the tank, so the plumbing doesn't need to be disconnected in order to remove the tank. Very helpful! My 83 Aspencade is a new machine this year thanks to all these articles. First bike I've ever owned with a false tank. Hi hope you can help me out. I pulled false tank and didn't mark the wires because your post said you can't mix them. Well thats not true at lease in my case. A wiring dig. that shows the pump would be great. I have a brown/whit and green going to the pump gauge. I assume that goes to the brw/wht acc plus and that this is a light for the gauge. What I'm going to do is connect the pump to this wire so I don't have to kill the engine if I want to add air. The light isn't working and it ohms open. (if that is what it is.) Do you know the lamp number. warnett wrote: Hi hope you can help me out. I pulled false tank and didn't mark the wires because your post said you can't mix them. Well thats not true at lease in my case. A wiring dig. that shows the pump would be great. I have a brown/whit and green going to the pump gauge. I assume that goes to the brw/wht acc plus and that this is a light for the gauge. What I'm going to do is connect the pump to this wire so I don't have to kill the engine if I want to add air. The light isn't working and it ohms open. (if that is what it is.) Do you know the lamp number. The brown/white and green going to the gauge is just for the light that lights the gauge up. There is a wire (color not marked on schematic, and not recalled in my memory) that connects to the Brown wire off the parking fuse in the fuse block to supply power for the pump. It has an inline fuse before it gets to the switch. All you need to do is change the wire that has the inline fuse on it, so instead of connecting into the barrel connector that goes into the Park fuse, instead connect it to the brown/white wire that is also connected to the Acc terminal. That is how I had mine wired, and lets you run the pump when the engine is running, to avoid killing the battery (and inconveniencing the rider!). Schematic shows the light is a 7 watt light, but no type - you'll have to pull it out to find out. Thanks for the reply. So I was right the gauge lamp was connected to the acc. So I'll just add a barrel connector there or splice it into the wire going to the pump. I'll see if I can pull that blub out. I'm sure the rubber holder isn't going to want to come out easy. Thanks for you help. You must have good sources for schmatics. warnett wrote: Thanks for the reply. So I was right the gauge lamp was connected to the acc. So I'll just add a barrel connector there or splice it into the wire going to the pump. I'll see if I can pull that blub out. I'm sure the rubber holder isn't going to want to come out easy. Thanks for you help. You must have good sources for schmatics. That's right out of the Honda service manual, which I still have from when I had my 1100. I cheated to remove my false tank. Removed the seat, the 2 bolts under the seat, then just went through the vent slot on the lower faring to get to the front bolts. Had it off the new electronic flasher in and back together in about 15 min. Now I can finish up my light conversion to all LEDs. lacanars wrote: I cheated to remove my false tank. Removed the seat, the 2 bolts under the seat, then just went through the vent slot on the lower faring to get to the front bolts. Had it off the new electronic flasher in and back together in about 15 min. Now I can finish up my light conversion to all LEDs. That's not cheating at all - in fact, that's how I normally did it on my 1100. I used the "shop towel" trick to make sure the bolt didn't fall out of the socket while doing it. Steve Can you show me a picture of the latch for the false tank. My lock messed up and I had to remove the FT to get it open. The only thing I see is the spring and I'm sure there had to be something else there above the spring or it would just fall out. I have looked and looked for another piece but I can't fine it if it fell. Also do you have any Idea where I can get another lock. I know I can use the one on the fairing but would still need one for there. Thanks for youir help. I followed all of the photos and all the recommendations to remove the shelter from my 1983 Interstate. The are no bolts located on my Interstate as shown in the pics in this article on my interstate. I can lift the back of the tank up . but still cannot locate these two phantom bolts holding the front of the false tank. is it that there are no front bolts on the Interstate? and is it possible that what I need to do it wiggle the tank into positon to get it to release from the frame? I am befuddle. I tried to find a picture of the underside of the tank ?? what am I missing and what am I doing wrong? Have to get to the coils to check the and do a little cleanup work on the coils and mounts.. I can see the rust just have to get to it. The bracket I colored in yellow fastens to the inside of the tank at the front, and is what is then fastened to the bike's frame. If that bracket is missing and the front bolts removed, and you don't have bolts at the rear, then there's nothing holding the tank in place - you should be able to lift it up. The tank is mounted the same on the Interstate. Did you remove the lower cowl covers? You can get to the bolts with them in place, but it's much easier to see and access the bolts if you take them off - it might be worthwhile taking them off the first time. found them and removed false tank this morning . They were right where they are pictured in this article except they were hex head screws. That is what threw me off. Now that everything is exposed I have a question about two wires one leads back to the faring . however at the other end it was dangling by the battery box with one hole missing a plug . I followed it to the fairing that is al fine up there .. it is at the battery there is something missing. I tried to take the best pictures . to show what I am speaking about. Today I noticed that the starter button was sticking . have to disassemble and clean. This is what happens when it press the starter button. the front headlight flickers and the goes out until the button releases. did not notice this before. Any suggestions, where to look to find a cure for this problem.. I have the spark plugs soaking . I now have access to coils but have to let the screws set for a day before I attempt to take them off and check them..
First want to join many others by saying how helpful your posts are. I got my '83 1100i last year and am in process of sprucing it up. My pull cable just broke while I was pushing on a new throttle grip. And after reading your replacement instructions I noticed that my push cable has been broken/missing all along @ the bell crank end...wow lol. But my question here is specific to the false tank so I figured putting it here made sense. From the exploded diagram mine is missing the torsion springs #16 & #17 along with the bolts connecting it to the crossmember you have colored in yellow. So it just came right off upon removing the back two bolts under the seat. Since these springs are not available through Honda any longer, do you have any recommendations on where to find some or their specifications perhaps so I can maybe get them fabricated? I know they are completely optional but it would be nice to have things present as designed. I can post some pics of course. Thanks in advance.